Introduction: In this article, Mary Harrell-Sesniak explains how ships’ passenger lists can help you trace your ancestors’ journeys to and arrivals in America—and she provides dozens of links to passenger list websites. Mary is a genealogist, author and editor with a strong technology background. Tracing the ship journeys of your immigrant ancestors is an undertaking all family historians should do. A helpful resource for this kind of research is ships’ passenger lists, which can report your ancestors’ full names, what countries they came from, and when they arrived in America. 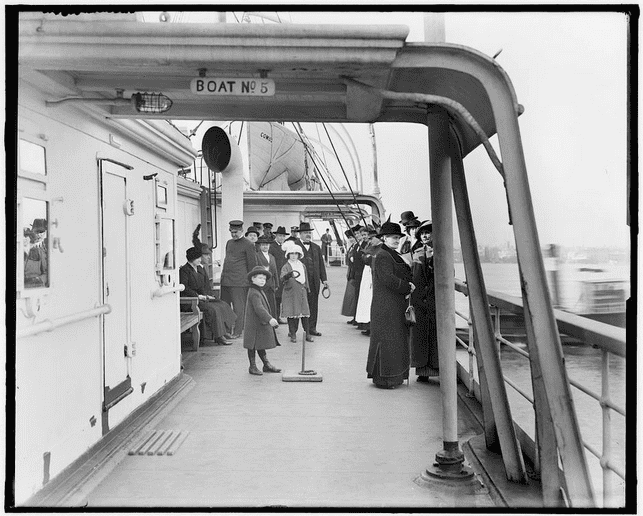 Photo: passengers on the deck of the steamship Comus. Credit: Library of Congress. Since there is no comprehensive online genealogy resource featuring all the passenger lists, researching them is a time-consuming task. To complicate matters, some old passenger records have been lost or destroyed. Don’t despair, however—there is hope for research success: many passenger lists have been transcribed or digitized, and are available for online searching. What’s more, passenger lists were routinely published in the newspapers of the time; any comprehensive collection such as GenealogyBank’s Historical Newspaper Archives will contain thousands of passenger lists. One of the most comprehensive studies for pre-1820 arrivals in America is Passenger and Immigration Lists Index, which was compiled by William P. Filby and Mary Keysor Meyer (Detroit, Michigan: Gale Research, 1981). Known as “Filby’s” to researchers, this body of work consists of 15 volumes and contains over 4.5 million names. It’s available at select libraries and in several subscription services. Since a primary portion of the records in Filby’s study came from newspaper reports, be sure to explore GenealogyBank’s Passenger Lists in Newspapers 1704-1984 collection. Because shipping was a mainstay of early commerce, newspapers routinely advertised sailings and reported the arrivals of passengers and goods from foreign and domestic ports. The information you’ll uncover in passenger lists varies. Some accounts include little more than the ship or shipmaster’s name for both incoming and outgoing vessels. Other records reveal a count of passengers and the names of most of the passengers. In some cases, the passengers traveling in steerage were not reported. 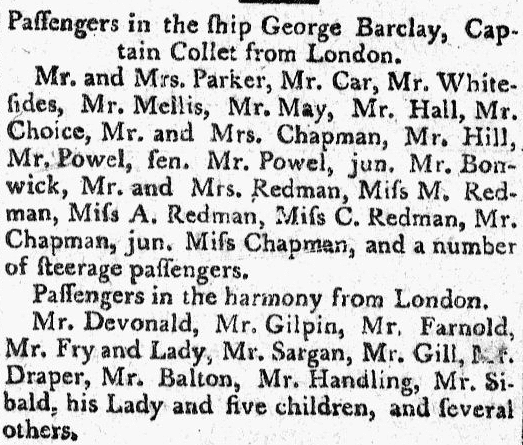 If you’re lucky, passenger list records will report full names, or refer to travelers by title, as seen in this passenger list published in a 1793 Massachusetts newspaper. 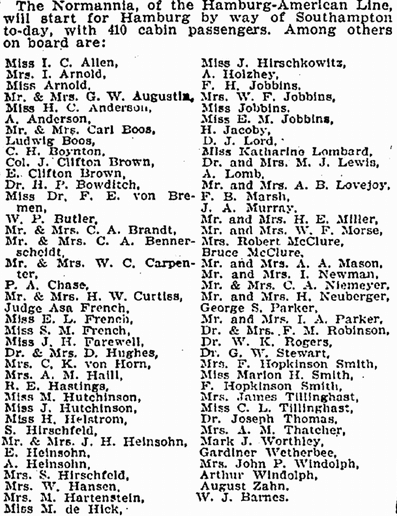 Here is another example of a passenger list, this one published in an 1895 New York newspaper. Many websites feature, or refer to, passenger lists. Some have searchable databases, lists or links to other websites. FamilySearch Historical Record Collections include over 30 archives pertaining to California, Florida, Hawaii, Louisiana, Maryland, Massachusetts, New England, New York, Pennsylvania, South Carolina and Washington. The collection continues to expand; one of the newest databases is Washington, Seattle, Passenger and Crew Lists of Airplanes, 1947-1954 at https://familysearch.org/search/collection/2299373. 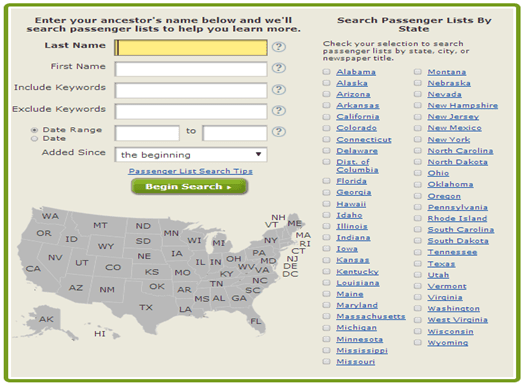 To search other passenger lists, enter “passenger” at https://familysearch.org/search/. Manifests were created at the port of embarkation, so you may wish to research foreign records. The following is a brief list of online resources for tracing your immigrant ancestry in passenger lists. If you have other passenger list links to share, please tell us in the comments section! It’s not only passenger lists that are important, but also the crew lists, which are much harder to find. That is a great tip. Thank you for sharing. Thank you for writing. I didn’t locate any clues that would help in GenealogyBank’s historical newspaper archives, but have some suggestions. Try searching at “One Step Webpages by Steven Morse”, which queries other sites, such as Ellis Island and Castle Garden. Many report his advanced techniques return superior results than the original sites. Download Katherine R. Willson’s “Genealogy on Facebook” list to find social media pages where you can post more queries. One of my favorites is “Random Acts of Genealogy Kindness International”, where people from all over the world work to solve genealogical challenges. I have been doing research into my family tree & have some ifo regarding your Aunt Rhoda Barrett. You’re very welcome. Thank you for creating this list.